The Backstreet Boys may still be poppin’ bottles, but that has a very different meaning for the five-some these days. While they used to stock their VIP room with booze for their hard-partying pals, the space has a decidedly different vibe now. “It’s the VIB room, Very Important Baby,” Nick Carter joked — one of many confessions from the Backstreet Boys’ latest interview on balancing parenting with touring for People magazine. Don’t be mistaken: There’s still bound to be plenty of screaming as the group hits the road for their new world tour in promotion of their tenth studio album. Only it’s been 25 years since they burst onto the scene… and that screaming is now likely to come in equal measure from their fans and from their own kids. Like most working parents, they’ve had to figure out how to strike a solid work-parenting balance. And, as is the case with most working parents, the result is essentially a study in calculated chaos. “We have a family room backstage for the family and the wives and the kids to hang out in,” Kevin Richardson explained, noting they now tour with their broods in tow. The guys definitely have enough offspring among them to start their own second-generation boy band, should they feel so inclined. And, not surprisingly, their progeny — seven of whom made it into People’s iconic group photo — are every bit as charismatic and photogenic as their famous fathers. Richardson and his wife, Kristin Willits, are parents to sons Mason, 11, and Maxwell, 5; Howie Dorough and his wife, Leigh Boniello, have sons James, 9, and Holden, 5; Brian Littrell and his wife, Leighanne Wallace, have a son, Baylee, 16 (not pictured); Carter and his wife, Lauren Kitt, have a son, Odin, 2; AJ McLean and his wife, Rochelle Deanna Karidis, boast the group’s only girls with daughters Ava, 6, and Lyric, 1. Although they’re now basically one big, happy family (Carter has dubbed backstage of their tour “daddy daycare”), the guys don’t put on airs about the fact that their fame isn’t without a bit of humbling history. “You have moments of huge success, and I think we all, when we first had some success, we all went through a little bit of ego, you know, the big head, but we had the five of us to keep our egos in check, because we were the only ones that could do that,” said Richardson. It wasn’t until the onetime teen heartthrobs started making babies in addition to hits that they realized maybe there was more to life than partying like a rock star. 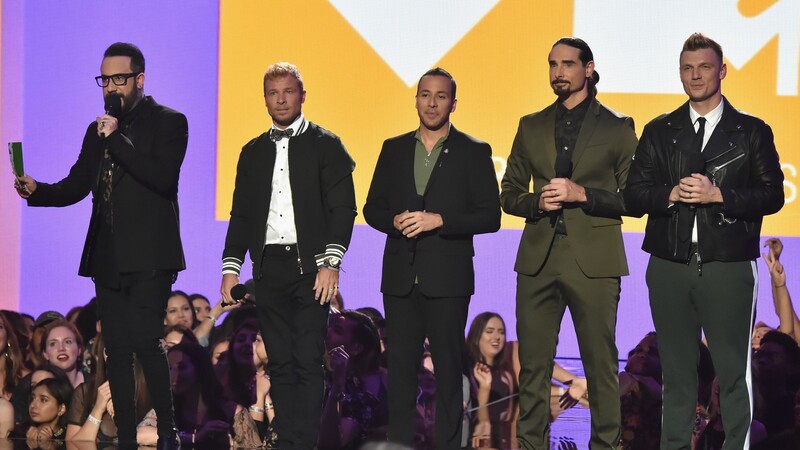 We won’t lie: The dad life seems to suit the Backstreet Boys, and we wouldn’t have it any other way.